In recent time the Government has expressed concerns for Domestic Violence issues but just how aligned is their rhetoric to their actions? 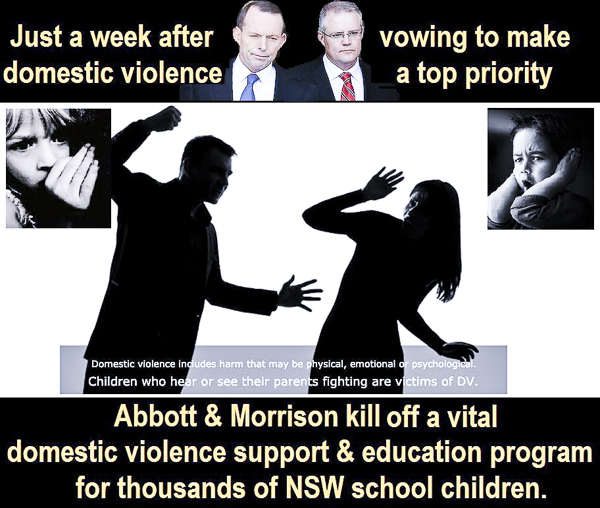 The announcement of $4M for a Domestic Violence hotline has the appearance of affirmative action but then Abbott’s contribution as the Minister for Women, was to axe the funding for education in school around Domestic Violence. This in not the only axing he has been doing in this field. There are a significantly smaller numbers of Women’s shelters available to women and children fleeing domestic Violence since funding to women’s shelters was axed. The assertion that women are after all free to move away and seek shelter has been reduced to the point that what shelters are left are turning women away. So $4M for a DV hotline is a tokenistic effort on the part of the government designed for maximising publicity and deflecting bad publicity at a relatively low cost. It is an illusion to garner the publics gratitude that they are doing something for this cause in the hope that no one notices that the total sum of effort has still been a withdrawal of support for the victims of domestic Violence! It is actually a cynical and manipulative gesture. Similarly cynical is Mr. Abbott’s recent contribution as the Minister for Women to axe family tax benefit for women in certain “classes”. 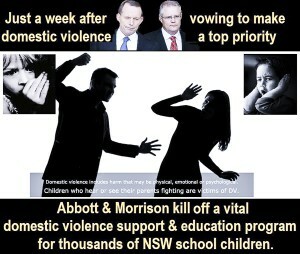 This was just after he’d axed the funding for education in school around Domestic Violence. You’d assume he thought, “Aren’t men better behaved nowadays now the Adults are in charge”? Women are after all free to move away from these bad domestic situations and seek shelter in … oh ummm … there are a great deal less shelters now. The sum of these three axings is that it makes it even harder for women with children to escape domestic violence. Perhaps they could seek shelter in the Tattersalls club. Apparently they are receptive to women nowadays. Wasn’t Abbott claiming they “they’ve now broken down the last barrier and they’ve made the men’s only club admit women!” when they celebrated International Women’s Day there? Perfectly appropriate for him to celebrate the day there. He is the Minister for Women, he had membership. I mean who else needed to attend? Although perhaps the reality is that Tattersalls isn’t actually making any changes to protocol in so far as access to women is concerned. , as they have always been allowed in. Unless of course they are seeking membership. Women have long been granted access, just not membership! So I hardly think this is a sign of any change whatsoever. I used to go to regular dance events at Tattersalls over a decade ago and I wasn’t there to dance with other Men. So there is nothing changed there as he stated. Dear me is that classified as a “misdirection”, an “overreach” or a “lie”, Mr Abbott? 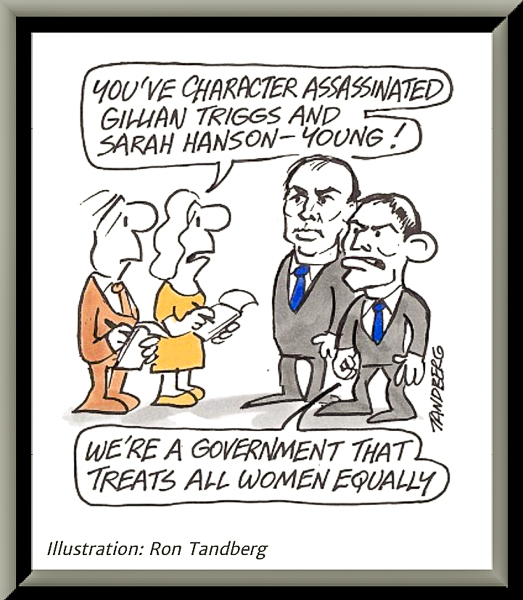 Besides, Abbott hosting his celebration of International Women’s Day there is perfectly appropriate for him. It makes perfect sense and I understand the congruence inherent in this decision by the Minister for Women. It is totally in line with all his previous decisions in regards his portfolio. Makes perfect sense to me! Allow me to elucidate a little. In truth his position allows him significant control over women’s issues. It allows the inequality of pay and position to remain the status quo (actually latest figures show the gulf has widened), allows him to shutdown women’s shelters, revoke funding for Women’s Leadership programs and the Financial Counselling/National Shelter programs all which provide direct support for women & children. Shutting down funding for the 13 community legal services in Victoria which provides for the same. It ensures the “Women’s Budget Statement” which has been a part of the federal budget papers for 30 years, ceased to exist in 2014 onwards. Let’s not forget how he castigates women verbally as exemplified by repeated gaffes that cast women in the kitchen and relegate their only conceivable role to that of unpaid housework. Lately, mother’s are “dirty leaning double-dipping rorters of the system” just because these scheming women want to spend the first 6 months of their child’s life, with them rather then getting back to work the moment they leave hospital and are no longer entitled to sick leave. 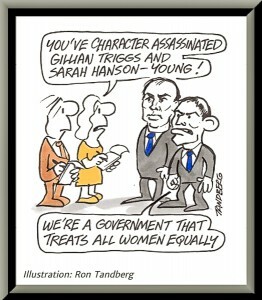 Adding to that list his role allows him to ignore the issue of domestic violence, amongst other crimes. Like I said, very active. His greatest Achievement for women? The choice of taking on the position of “Minister for Women” ought to be more properly seen as a huge #¥€< you to women in general. So don’t expect any real improvements for Women at all under Abbott! Like I said he’s been working very hard, it’s just that title that confuses me, because I would have thought that middle word was spelt “f” “i” “x”, not “f” “o” “r”? Still a Minister who thinks we need to “fix” women! It’s three months down the track since I wrote what’s above (now September 2015). 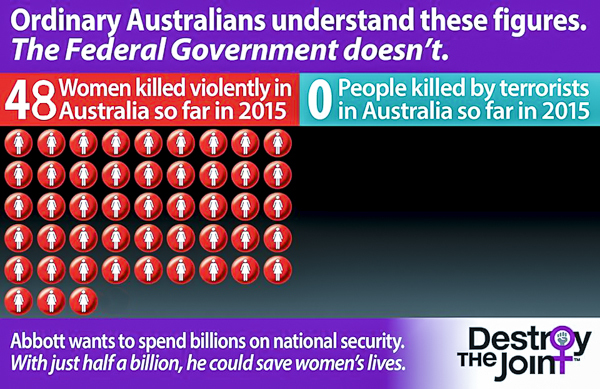 The Death rate is 65 Women and Abbott is gone. Malcolm Turnbull has clawed back only a small proportion of the funding for Domestic Violence that Abbott stole but it is merely a bandage on a gaping wound. 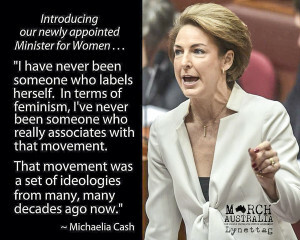 Changing the Minister for Women to a woman who has clearly stated she doesn’t believe in feminism is not going to help. The problem with both Abbott and Cash is that they both think the middle part of their title is “fix” not “for”. Abbott stole $300M from DV social support funding. Just for they whom believe Malcolm putting a third of that back is an improvement, let’s think about that a bit. 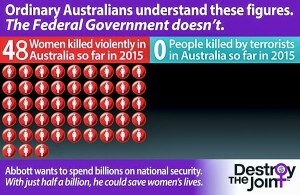 So the government is going to put money back into domestic violence but not to the extent to that which they took out. People get excited about the government and say “isn’t this a great start“. And “heading in the right direction“. Nobody of course pays attention to the net loss figure as there is just a presumption that it is moved away from the point that Abbott left it in. It is essentially the strategy of many a politician to appear to act in the interests of the people as the election draws near. Let’s face it who remembers – in the short news cycle of contemporary society – what the net change in funding and societal harm has been created. People react positively to the perception that things are changing in a direction that benefits society without recognising that the total net movement has been to its detriment. A wave of positivity and a lack of critical analysis results, and the results are the government gets in for another three year term where they rework the same cycle that they have been successful with in the past. An improvement would be $400M! This is just political misdirection! Hopefully your not buying into it. Don’t get me wrong, I’m glad he’s done it but … too late and not enough! The title is: “Minister FOR women”!